Wen Jeng Chen, Ph.D., P.E., won the Jack Frarey Memorial Award for Excellence from the Vibration Institute in recognition of his contributions to the field of rotor dynamics. 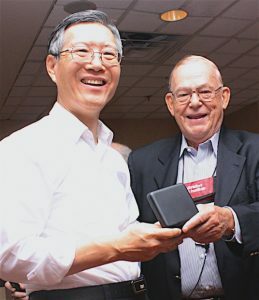 Dr. Chen was presented with the award at the Vibration Institute’s annual conference in June in Asheville, NC. His contributions span a broad range of topics, combining a unique combination of practical work in the field and outstanding research. Dr. Chen’s most significant accomplishment has been the development of Dyrobes, a finite element computer code that has revolutionized the process of both rotordynamics and bearing analysis, making it possible for engineers to solve complex rotordynamics problems. Dyrobes is now widely used by government, industry and universities worldwide. Dr. Chen has published numerous journal papers and written two standard textbooks on vibration, rotordynamics and bearing design. A Fellow of ASME, he has also received the IR President’s Award as an employee at Ingersoll-Rand Company. the H. H. Jeffcott Award for outstanding ASME technical paper on rotating machinery, and is listed in Who’s Who in Science and Engineering, 2000/2001.